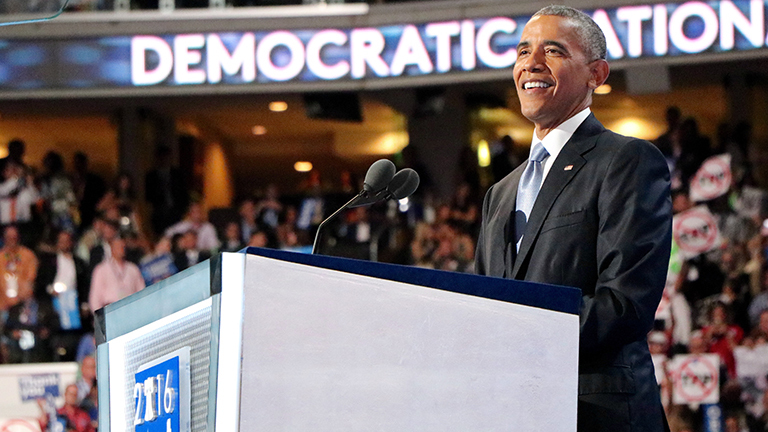 On Wednesday, President Barack Obama made the case that Hillary Clinton should be the nation’s next president while acknowledging the hardships facing Americans across the country. "The America I know is full of courage, and optimism, and ingenuity. The America I know is decent and generous. Sure, we have real anxieties – about paying the bills, protecting our kids, caring for a sick parent," Obama said. "We get frustrated with political gridlock, worry about racial divisions; are shocked and saddened by the madness of Orlando or Nice. "There are pockets of America that never recovered from factory closures; men who took pride in hard work and providing for their families who now feel forgotten. Parents who wonder whether their kids will have the same opportunities we have." While Obama states, "nothing truly prepares you for the demands of the Oval Office," he went on to say that Clinton is ready. "She knows what’s at stake in the decisions our government makes for the working family, the senior citizen, the small business owner, the soldier, and the veteran," Obama said. "Even in the middle of crisis, she listens to people, and keeps her cool, and treats everybody with respect. And no matter how daunting the odds; no matter how much people try to knock her down, she never, ever quits. Obama also reached out indirectly to Bernie Sanders supporters who don’t agree with all of Clinton’s positions. Join “Chicago Tonight” for continued coverage of the Democratic National Convention all week. July 27: Illinois Democrats may be a disjointed bunch, but they do have one thing in common: support for labor unions. July 26: On the second night of the Democratic National Convention, Hillary Clinton makes history while former President Bill Clinton recounts the history of his relationship with his wife. Elsewhere in the city, protests raged on. July 26: Cook County Board President Toni Preckwinkle, a Hillary Clinton delegate, says supporters of Vermont Sen. Bernie Sanders “will fall in line behind” Clinton. July 26: Former Secretary of State Hillary Clinton on Tuesday became the first woman in the history of the U.S. to earn a major party's nomination for president.